The 2019 American Casino Guide provides casino-goers with money-saving, detailed information that can be helpful for both seasoned casino veterans, as well as first-time casino visitors. Anyone who is looking to learn more about gambling, or simply planning a gambling-related vacation, will find the book to be extremely helpful. The guide provides detailed information on more than 750 casino/resorts, riverboats and Indian casinos in 41 states, including room rates, buffet prices, casino games offered and any special features. 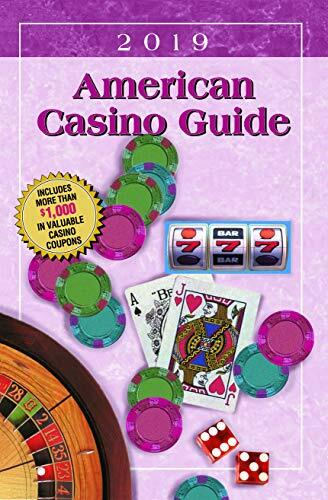 The book also has maps of all casino locations, plus detailed information on the best strategies for playing the major casino games such as blackjack, craps, roulette, baccarat, slots and video poker. For extra savings, the book also contains more than 200 casino/travel coupons valued at more than $1,000. Offers for FREE: rooms, meals shows, drinks, gambling bonuses and more! There are also of tips on how to always get the most value for your money by taking advantage of casino promotions and slot clubs. The book also discloses the actual slot machine payback percentages for every state’s casinos. And, for RV travelers, the Guide notes which casinos have RV parks and whether or not the casino will allow an RV to park overnight for free in the parking lot. A must for anyone planning a visit to a casino!